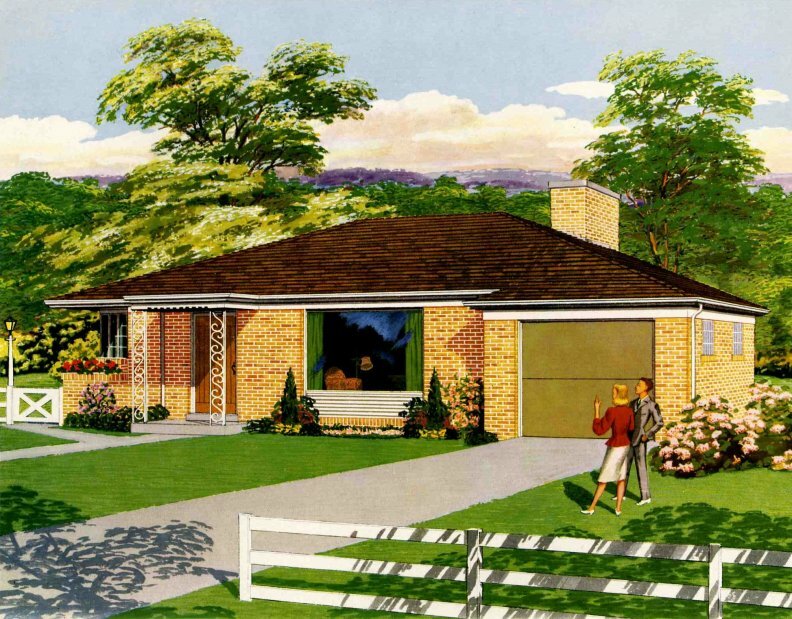 This year I was really fortunate to nab a real treasure –an expansive portfolio of 1950 home plans, from the Indiana Lumber and Coal Company. 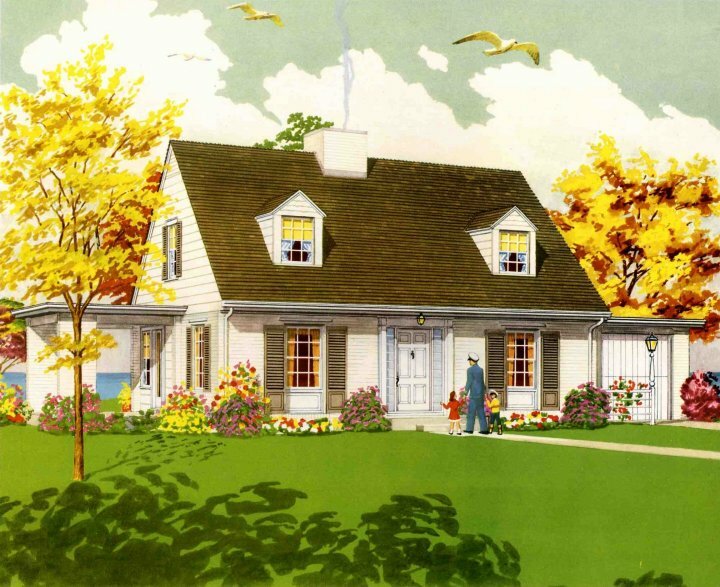 It is a big, wonderful binder – 18″ x 24″ – with 37 large watercolor prints of home plans for sale from the National Plan Service, Inc., copyright 1950. It appears that potential homebuyers would come into the store and look through this binder. Or even more likely – considering the minimal wear, they ordered a copy of their own and spent time with it at home. It must have been expensive, though – the binder is in full color and huge. 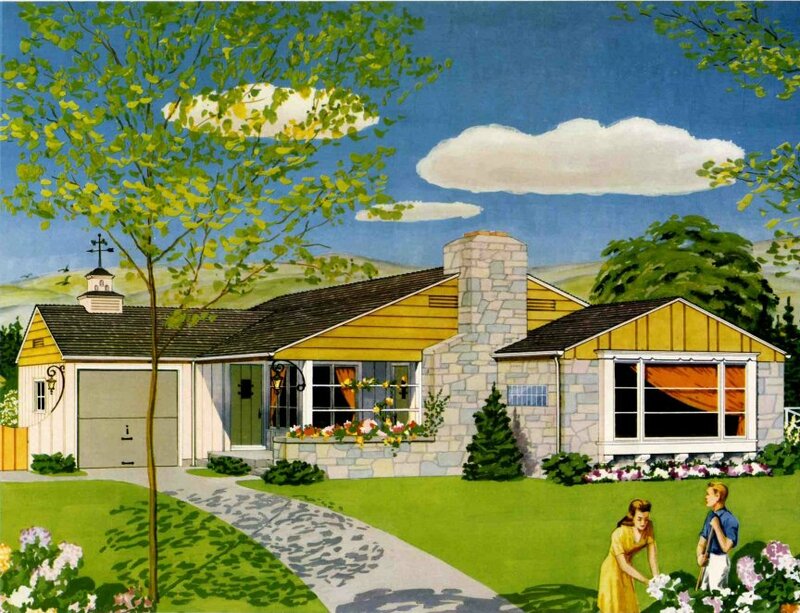 From what I can tell googling around, the NPS was a prolific distributor of house plans in the postwar era, although I can’t find any mention of them still existing today. Over time, I will feature all of these homes. They are just stunningly beautiful. So full of hope and appreciation and simple amazement for this thing – a new house. In addition, the watercolors showcase lots of design details that we all love to scrutinize and potentially apply to our own retro renovation projects. Which one to start with? At first, I thought, a tiny house. Because back then, that was enough. Plenty. Then, I saw this image. Dad’s come home. Makes me think of the William Levitt homes built in NY/PA/NJ. I grew up next to his NJ community (now Willingboro, NJ) and knew some people that lived in Levittown, PA. 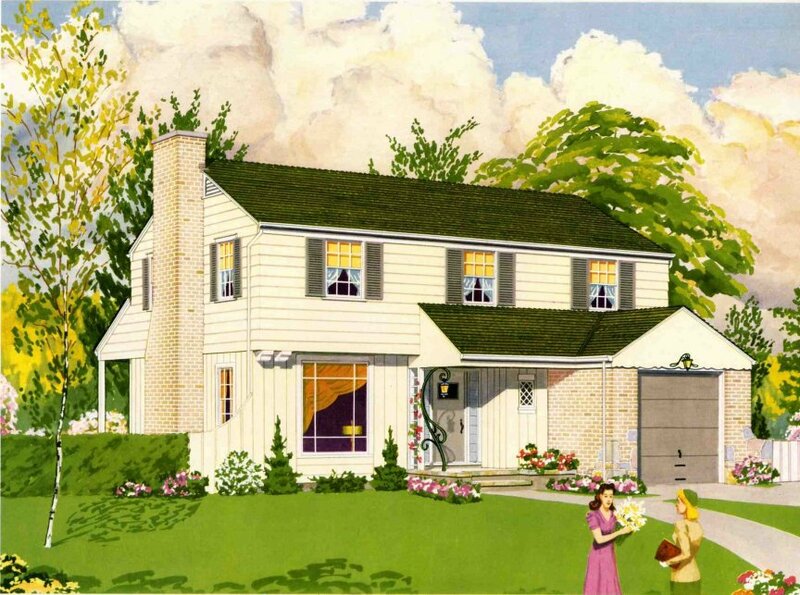 The ad is so charming-and definitely NOT like today’s McMansions-blech! Just wow. Love the lake in the background. NPS was even around in the early 1900’s. The lumber companies used designs and catalogs from NPS to compete with the catalogs offered by Sears and the other kit home manufacturers.